Frequency Analysis of Vibration Energy Harvesting Systems aims to present unique frequency response methods for analyzing and improving vibration energy harvesting systems. Vibration energy is usually converted into heat energy, which is transferred to and wasted in the environment. If this vibration energy can be converted into useful electric energy, both the performance and energy efficiency of machines, vehicles, and structures will be improved, and new opportunities will open up for powering electronic devices. 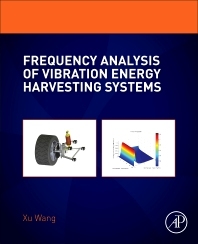 To make use of ambient vibration energy, an effective analysis and design method is established and developed in this book. The book covers a wide range of frequency response analysis methods and includes details of a variety of real-life applications. MATLAB programming is introduced in the first two chapters and used in selected methods throughout the book. Using the methods studied, readers will learn how to analyze and optimize the efficiency of vibration energy systems. This book will be ideal for postgraduate students and researchers in mechanical and energy engineering. Xu Wang is Associate Professor in the School of Aerospace, Mechanical and Manufacture Engineering at RMIT University, Australia. He is also a Fellow of SAE, IEAust, CPEng.